Grab the Resident Evil Revelations 2 Season Pass and get Episodes 2, 3 & 4, Two Extra Episodes, and Resident Evil's infamous anti-hero, HUNK, for use in Raid Mode. All Season Pass content will be available by March 31, 2015. All content featured in the Season Pass will be available for individual purchase from the Xbox Games Store. If you purchase the Resident Evil Revelations 2 Season Pass, all future content that is part of this pass will be accessible in-game as well as the Xbox Games Store once it is available. Resident Evil Revelations 2 - Episode 1 required; sold separately. Resident Evil Revelations 2 - Episode 1 required; sold separately. Xbox Live free membership required. Xbox Live Gold membership required for multiplayer features. Episode Two: Contemplation - Includes Claire and Barry campaign, and Raid Mode. *Additional Raid Mode characters and stages included. Resident Evil Revelations 2 - Episode 1 required; sold separately. Xbox Live free membership required. Xbox Live Gold membership required for multiplayer features. Episode Three: Judgment - Includes Claire and Barry campaign, and Raid Mode. *Additional Raid Mode characters and stages included. Resident Evil Revelations 2 - Episode 1 required; sold separately. Xbox Live free membership required. Xbox Live Gold membership required for multiplayer features. Extra Episode: Little Miss - Includes Natalia's side story, and an original costume. Resident Evil Revelations 2 - Episode 1 required; sold separately. Xbox Live free membership required. Xbox Live Gold membership required for multiplayer features. Resident Evil's "Angel of Death", HUNK, joins Raid Mode. Conquer foes with his exclusive Stealth Cloak skill. Resident Evil Revelations 2 - Episode 1 required; sold separately. Xbox Live free membership required. Xbox Live Gold membership required for multiplayer features. Extra Episode: The Struggle - Includes Moira's side story, and an original costume. 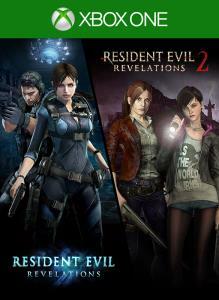 Resident Evil Revelations 2 is a survival-horror thriller featuring the interwoven stories of Claire Redfield and Barry Burton across 4 playable episodes. This deluxe bundle includes the complete story, extra episodes, extra costumes, additional Raid Mode characters, throwback maps and additional storage slots. All 4 story episodes, 2 side stories and HUNK character for Raid Mode. RER2 is a brand new type of survival horror game, featuring two interwoven stories across a total of 4 episodes.